Each public land agency within Washington State has its own rules regarding harvesting mushrooms for personal use. Additionally, different regions under a jurisdiction may have different rules. The following list covers the major agencies whose lands we use, and their rules as of 2016. The list is not guaranteed to be accurate, and is meant as a guideline. If you have any doubts about the rules for a given harvest area, please contact the relevant agency and district. Inquire about access, permits, limits, seasons and any other special rules. Note that rules for commercial harvesting are entirely different. This list was engendered by the much more thorough list from the Puget Sound Mycological Society’s web site, and focuses on our harvest areas. Olympic National Park: 1 quart per day. 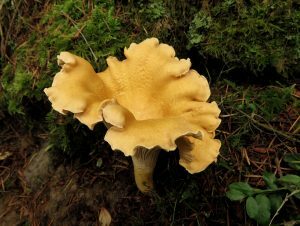 Olympic National Forest: 1 gallon or one larger mushroom per species, 3 gallons total per day, chanterelle cap diameter > 1″. Okanogan-Wenatchee National Forest: Personal use mushroom gathering – except Matsutake – of five gallons per day is free. A free Incidental Use Mushroom Information Sheet is required to be in the possession of anyone collecting morel mushrooms for personal use from the Okanogan-Wenatchee National Forest. Matsutake (pine) mushrooms have varying rules by district. Washington State Parks: 2 gallons per day. “The recreational harvest, possession, or transport of… edible mushrooms… is allowed up to an amount of two gallons per person per day, unless otherwise posted at the park. The harvest amount may be comprised of one or more edible species… No harvest of… mushrooms is allowed within a natural area preserve… Harvest techniques that involve raking or other techniques that have the potential to degrade park natural or cultural resources are prohibited.” A gray area exists on whether a club activity is educational, in which case a research permit is required, for ID harvests only. Washington State DNR (“Other Activities”): Limited to three gallons of a single species per day, not to exceed nine gallons plus one mushroom per year. Kitsap County Parks: Personal use only and cannot be sold or used for barter. Three gallons per person per day, one gallon or one mushroom larger than a gallon in size per species. Chanterelle cap diameter > 1″. Mushrooms stems are to be cut at or above ground level, keeping the growing site as undisturbed as possible. Use only a knife or scissors to harvest mushrooms. Mushroom Etiquette: 1) Respect private property! 2) Pick only two-thirds of the mushrooms you find. Do not collect mushrooms from previously harvested areas; leave the rest for spores and food for wildlife. 3) Minimize the impacts to the actual fungus by not disturbing the ground habitat. This means do not use rakes, dogs, pigs or other methods to dig mushrooms. Use a knife to cut the mushroom to minimize the impact to the fungus.